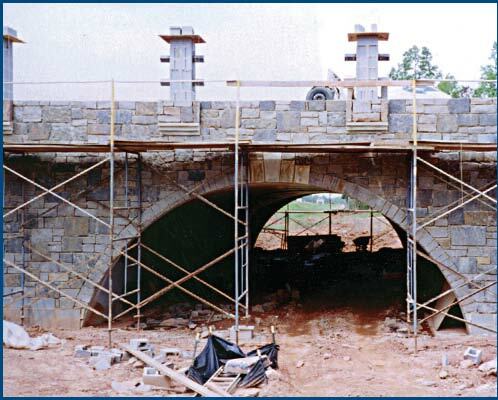 Crescent Land & Timber envisioned a specific look for this golf cart underpass on the Ballantyne Golf Course in North Carolina and choose a CON/SPAN® structure from Contech for the solution. To achieve the rounded arch appearance with CON/SPAN®’s speed-of-installation and cost-saving benefits, the design called for stone facade treatment. The engineering design included dovetail inserts on the endwalls and wingwalls to accommodate architectural panels hanging from the facade. Stone was then placed over the panels. In addition, the wingwalls were set parallel to the roadway above the structure for a streamlined appearance. The course at Ballantyne Country Club was designed by renowed architect Rees Jones and is part of an upscale housing subdivison within Crescent Communities, Inc. Homes within the community start at $400,000 and range to more than $1 million.